I had the opportunity to attend the COP 22 event of UNFCC in Marrakesh Morocco in November 2016. The climate has given according to the expert ,”go ahead” on developing the “rule book”for Paris Agreement, including the global adaptation communication systems ,and finance assessment systems for building resilience . In Asia ,Bangladesh ranks third after Myanmar,Philippiness and is followed by Pakistan, Vietnam and Thailand. According to Global Climate Risk Index 2017 estimates nearly 11,000 extreme weather events occurred between 1996 and 2015,which caused over 528,000 deaths worldwide ,resulting around in around US$3,08 trillion in associated financial loss. At the international conference on resilience at ICIMOD Nepal in December 2017 , regarding committing to resilience –building solutions ,mapping the way forward ,Nand Kishor Agrawal ,a climate change adaptation and resilience expert of ICIMOD Nepal talked about it . Nand Kishor ,said “In the next few years ,actions on commitments by global leaders as part of several important conventions, such as the United Nations Framework Convention on Climate Change (UNFCCC), the Sustainable Development Goals (SDGs) ,and the Sendai Framework, will determine the future of sustainable development, climate change and resilience building”. Appropriate policies and actions in the mountains are generally not on main agenda of global discourse but they are crucial to achieving global goals. In order to strengthen efforts to position the mountains as a key concern in the global agenda. It is crucial that actors in mountain regions make their voices heard. In order to achieve this, it is necessary to understand change and raise awareness on resilience from a mountain perspective ,to develop options and opportunities for developing resilience building solutions for Hindu Kush Himalaya, and to foster partnerships for action by linking global processe and strengthening regional cooperation, Nand Kishor opined. Bangladesh ranked sixth among the worlds top 10 countries most affected by extreme weather events in the last 20 years, according to the Global Climate Risk Index by the think-tank German watch. on an average ,a total of 679.05 people died in 185 climatic events in Bangladesh within the period of 1996 to 2015. As a result, the country lost 0.7324 percent of its GDP. The annually published Global Climate Risk Index analyses to what extent of countries have been affected by the impacts of weather – related loss events (e.g storms, floods heat waves). Bangladesh sits at the head of Bay of Bengal. The sea surface temperatures have seen a marked rise over the years. Scientist estimate the climate in Bangladesh could lead to one of the largest mass migrations in human history . Bangladesh is considered one of the countries at risk to the effects of climate change ;and the coastal area is most vulnerable . Climate Change is perhaps the most widely discussed issue among the recent global environment changes and research studies show that it links to natural disasters affect the social and economic wellbeing of populations. Climate change is happening both global and local levels and would lead to adverse impacts ,Agricultural productions, population health, and natural ecology had already been affected by climate change in their justification with more extreme weather events. Coastal population financial life has been affected by climate change and due to a lack of job opportunities, to maintain the household expenses , some of the families and in some cases the heads of the households are leaving the village and migrating to different cities . The impact of climate change will be felt by different parts of the world and by different people, poor countries like Bangladesh are going to be worst hit. 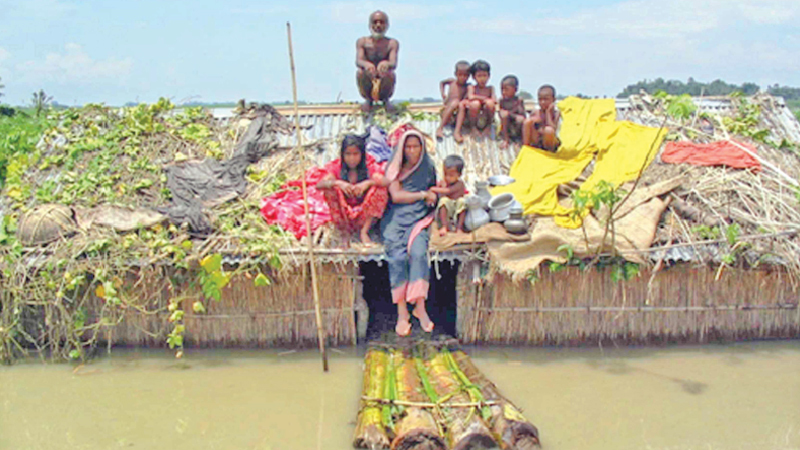 According to the fifth report of the Intergovernmental Panel on Climate Change (IPCC) of the United Nations, Climate Change fallout for Bangladesh is very gloomy. The pace with which at present the sea level is rising, by the year 2050, 35 to 50 million people would become climate change refugees in this country alone. The ice of Greenland and Antarctica is melting faster than any other time at present ,Besides displacing this huge number of people, by that time ,greenhouse emission would also cause temperature to increase by 5 to 7 degree Celsius. In the South Asian region, countries like Nepal, India and Srilanka among others are also becoming victims of climate change and the scourage that Bangladesh is facing ,is greater than other countries . Considering all the problems , developed countries should constantly stand by Bangladesh in its effort to build all kinds of infrastructure for helping the rootless people who have already lost their belongings to super cyclones. These cyclones have already created a great number of internal climate change refugees, Regional cooperation of South Asian Coutries and the Hindu Kush Himalaya is urgently requires to build climate change resilience.